Karen Forbes exhibits internationally. 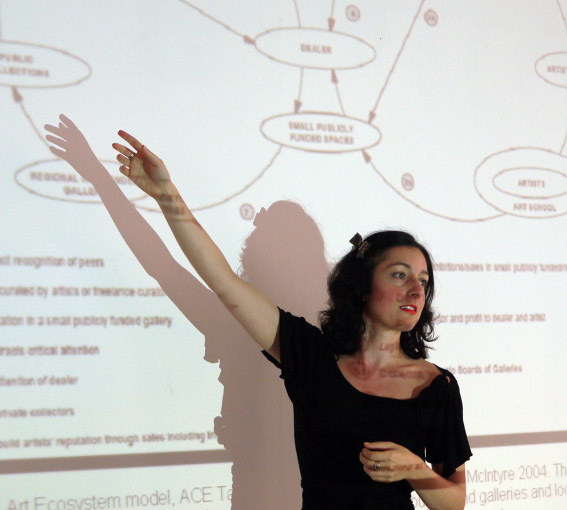 She has been awarded numerous prestigious awards, international residencies and fellowships including the Scottish Arts Council, Netherlands Residency, Amsterdam; Christoph Merian Stiftung, Basel, Switzerland, DAAD Stipendium, Dusseldorf, Germany, and a British Council Award (for spatial research) in Japan. 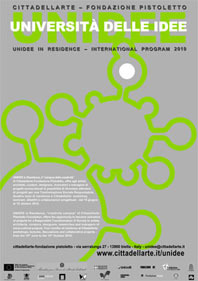 Recent international lectures and visits as guest critic, include Luzern Kunstakademie, Boston Museum School of the Arts, University of Limerick, RMIT, Melbourne, Australia, Faculty of Architecture Delft TU, Netherlands, Chicago Arts Society and Unidee, Fondazione Pistoletto, Italy. Recent art projects include work in Chicago, Kyoto, Barcelona and Melbourne. There are a number of publications about her work including the books ‘Locus of the City’ published by The Visual Arts Research Institute Edinburgh (VARIE) 2007 (with G. Brennan), ‘Moscow City Palace’ RMJM 2007 – distributed RIBA Books (with T. Kettle) and ‘Fold-Out Futures’ Volumes 1 + 2, RMIT Press, Australia 2008/9 (with Dr I. Barberis). Karen Forbes is Professor of Art and Research Leader at Edinburgh College of Art, Scotland with a strong focus on the integration of context, art and architectural thinking. Artist, co-curator/co-editor of Magazine in Situ, developer of liPac Laboratory of Investigation in Contemporary Artistic Practices in CCRRojas UBA (Ricardo Rojas Cultural Centre, Buenos Aires University) and lecturer in CCRRojas and other institutions. She is a graduate from IUNA (National University Institute of Art – Buenos Aires) and has received scholarships from the Argentina National Art Fund and Antorchas Foundation (Barracas Studio). Her artwork involves installations, videos, paintings, objects, archives, projects, drawings, performances etc. 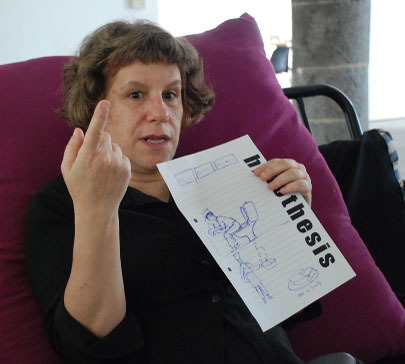 She had participated in biennials, residences and meetings including the 5th Havana Biennial in Cuba, the Satelite 4th Göteborg Biennial for Contemporary Art Rethinking Dissent in Sweden and The End of the World Biennial in Ushuaia, Argentina. She undertook residencies in Holland in Studios Duende (2000) and Kaus Australis Rotterdam (2001-02). In 2001 she was invited to participate in the 2nd Big River International in Trinidad and in 2006 to participate in the RIAA (Argentine International Artists’ Residencies) Ostende, Argentina, in the Frame of Triangle Artists’ Workshop. 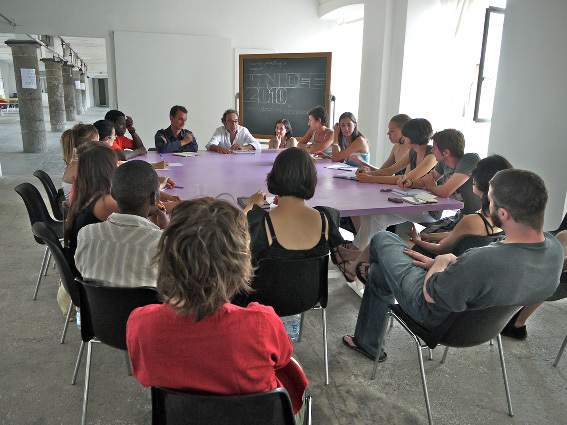 During 2007 she participated in ERA (Regional Art Encounter) in Montevideo, Uruguay and in Be(com)ing Dutch Eindhoven Caucus, Van Abbemuseum Eindhoven, Holland. In 2004 she launched Magazine in situ in different cities and since 2003 she has developed epa (open process experiences) in conjunction with courses in CCRRojas, Buenos Aires University. Her artwork can be found in several public collections including: MAMBA (Museum of Modern Art of Buenos Aires); MACRO (Museum of Contemporary Art, Rosario); Wilfredo Lam Centre, Havana, Cuba; Mendes Centre for Contemporary Art, Rio de Janeiro, Brazil and in private collections both in Argentina and abroad. 1. prelude: The role of the artist changed. In their daily work and especially in art projects in social / cross cultural environments or with experts from other disciplines the artist more often has to be or to act as a manager or entrepreneur. Management and entrepreneur skills, methods and best practices for strategy development and project management are usually not taught to artist. The workshops will bridge this gap and deliver project management and strategy development skills in a nutshell by working with the participants on their specific projects, questions or challenges. It is more a coaching with the purpose of individual learning than scientific education. 2. form: Workshops means that it will not be a lecture although basic concepts will be introduced at the beginning. Participants are asked to prepare a “case study” individually or in a team about their art project and use some management tools while creating the case study (reverse case study style). The team presents the case study as a presentation (powerpoint or form of their choice). We will work and reflect together about the different case studies, the tools used, the process of preparation and presentation. A presentation should not be longer than 45 minutes. Any participant will get individual feedback and advices on specific topics and their projects. After the workshop the participants will have developed new insights, which will give them – hands on – a greater variety of models for their work and on their individual competences ans strengths. The workshop language is in English. Critical discourse and the courage to attempt playful new thoughts and methods will be encouraged. The seminar will be facilitated, which includes feedback loops and evaluations. 3. assumptions: There is nothing like right or wrong. There are many ways of organising and developing a concept / strategy or the project. Any person involved in the process has its strengths and interests, which have to be identified and combined for the success of the project. Success can mean whatever the people involved (stakeholder) expected it to be or even exactly the opposite (unexpected). It is recommended to watch out for consistency in development and presentation of the case / the project and work on creating a sustainable competitive advantage fpr the project(value proposal by differentiation). A combination of gut feeling, critical reflection and use of methods / concepts will be appreciated and demanded from the participants. 4. preparation: Participants are asked to sign in for the workshop and name their nationality, languages spoken, education and art disciplines or profession. If they have a homepage it would be helpful to state the link. To ensure a common understanding we will have a telefon conference of 2-3 hours four weeks before the workshops and answer first questions (e.g. what does it mean to pepare a case study?). 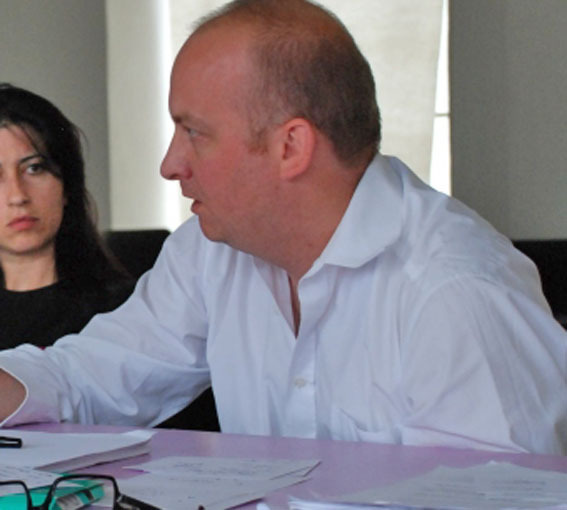 The participants have the chance to prepare their cases for eight weeks. Two weeks before the workshop there will be a second telefon conference for last questions / short presentation of first results if wanted. If it is difficult to define in the team process the final results it can be helpful to define the opposite of what is intended. Usually it is helpful to address some questions in order to define the project and the modules (see 7). What is a consistent form for the project and the products? How do we organise the realisation of the strategy? Who are our stakeholder? what are their interests? How do I set up a project plan? What has top priority? How do I calculate the business plan? Which are interdependencies, critical paths and potentials for the setup? What is our goal (qualitative and quantitative)? Our mission and vision? What do we want and why? What is the cultural environment? value proposal? What is senseful communication / packaging? How do we do agenda setting? What are our strength and weak points? How can we make improvements? What do we absolutely not want? 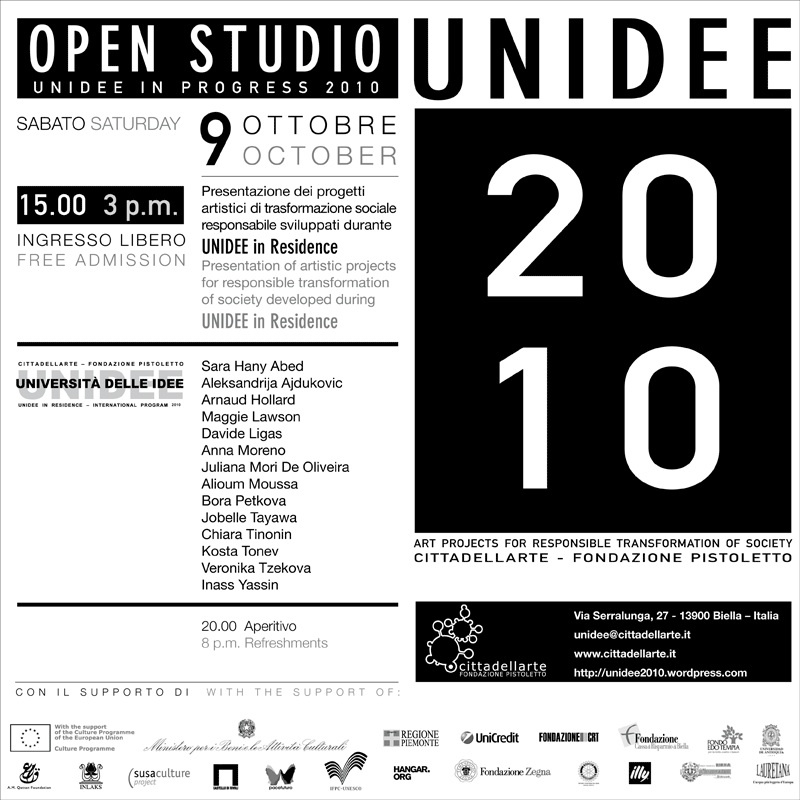 In 2004 UniCredit Group launched UniCredit & Art, a strategic cultural investment project. Inaugurated in Italy, it focuses on the promotion of emerging talents in the visual arts, music, theatre and literature. Activities are carried out via a partnership system that now encompasses long-term projects in all of the countries where the Group is active – across a geographical area extending from southern Italy to the Baltic countries, from Germany and Austria to Eastern Europe and Turkey. The commitment is made concrete both in their collection of works by young artists – which has updated their historical collection through new acquisitions and commissions – and in their participation in financing art projects and even providing housing for young artists – usually through programs involving cooperation with museum partners. In Italy in the past four years over €6 million has been invested in acquiring works by young artists with activities are now expanding all across Europe. an interest in the development of the art scene as a whole – but especially in the development of the cultural establishment – as expressed through initiating partnerships with major entities and institutions. Emilia Telese is an artist and writer based in Sussex. Born in Italy in 1973, Emilia graduated in painting from the Fine Arts Academy in Florence in 1996, following studies in literature and philosophy. Emilia has exhibited worldwide since 1994, presenting work in the New Forest Pavilion at the Venice Biennale (Italy 2005), Brighton Jubillee Library (UK 2007) Ars Electronica (Austria, 1999, 2003), ZKM (Germany 2002), Chashama (NYC, USA 2004), Centro Cultural Telemar (Rio De Janeiro, 2005), Manege (St Petersburg 2000), Leeds City Gallery (UK 2006), ArtSway(New Forest 2002, 2003) and the Freud Museum (London 2006). Her practice spans several art forms, including interactive and body-responsive technology, film and live art, installation, literature and public art. Her work often involves site-specific interventions in non-conventional spaces. During her career, she has slept in the New Forest; been chased by paparazzi in Venice; landed by helicopter in a Danish football field; changed her brainwave frequencies in the former stables of the Tzar of Russia in St Petersbourg; shut herself in a suitcase in Southend; eaten rosaries in Sigmund Freud’s home; and built Brighton’s Royal Pavilion out of ten tons of rice. Emilia founded the Edible Construction Company in 2006 with Chris Biddlecombe and Guyan Porter, an artist-led initiative creating socially engaged art in the public realm. She produces and presents Radio Sophia, a bilingual radio programme in Italian and English language on Brighton community radio Radio Reverb FM. Emilia Telese is represented by Artsway Gallery, New Forest. 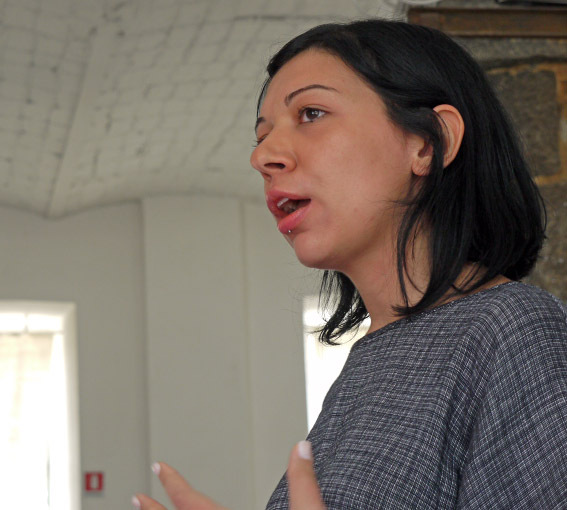 Alongside her practice, she is a visiting lecturer in more than ten art institutions in the UK and at the Palermo Academy of Fine Arts; she is also Artists’ Networks Coordinator for a-n The Artists’ Information Company . 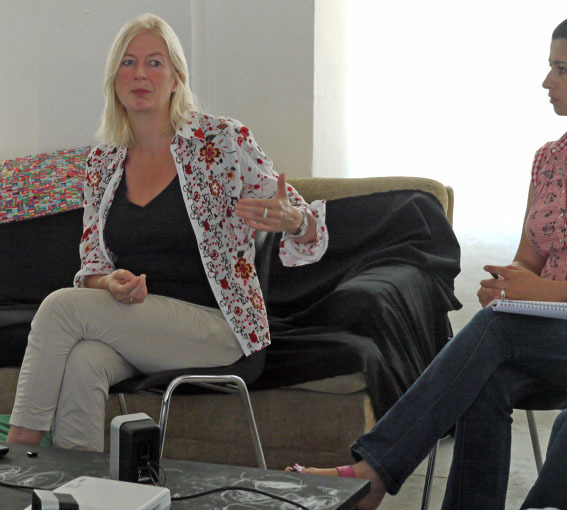 She works with UK and international arts organisations as an independent artists’ trainer specialising in professional development advice for artists. Pier Luigi Celli was born on 8 July 1942 at Verucchio, in the province of Rimini. He’s general director of the Luiss – Guido Carli University in Rome. He obtained a Sociology degree at the University of Trento and gained considerable experience as a human resources manager (management, organisation, training) for a number of large corporate groups (ENI, RAI, Omnitel, Olivetti and ENEL). In 1998, the managerial skills he had acquired while working for such large companies as these – with such diversified and complex business affairs – enabled him to return to RAI (Italy’s state radio and TV broadcasting corporation), following his appointment as General Manager. He briefly headed IPSE 2000, a UMTS telephony company, after playing a vital part in mobile telephony start up initiatives (Wind and Omnitel). He has been Corporate Identity Manager for Unicredito Italiano since 2002. His mission is to provide an identity for a group which, over the last few years, has aggregated seven concerns in Italy and five abroad. His duties include public relations, brand coordination, institutional relations, relations with the media and relations in the areas in which Unicredito Italiano is operational, the group’s social and environment report, and Fondazione Unidea (a Unicredit Group foundation,art banking). avveduto, L’illusione manageriale, Passioni fuori corso and Breviario di cinismo ben temperato. Two other works, Nascita e morte di un’impresa in 42 lettere and Impresa e classi dirigenti, were published in March 2004. In the 2006 was published Un anno nella vita. Racconti e memorie di un lungo addio all’impresa: a manager, in a pause of the existence, reflects on the long experience that has carried it, in spite of the heresies and the uncomfortable of the personage, at the head of important enterprises. The digging begins with the rappresentation of the ordinary life: minihistory of when the equilibrium, that it is perhaps the primary dowry of the manager, explodes. They follow the memories of infancy, in a small village of Rimini, a nostalgically felliniana aura. The travel in the experience is closed on the plan just of that it could define cues for one critical theory of the enterprise; participations and proposals center to you on those topical situations in which came out the paradoxes of one logical of the organization that forgets to have to that making with human beings. Pascal Gielen is professor of sociology of art at the University of Groningen and he is head of the research group ‘Arts in Society’ at the Fontys College for the Arts in Tilburg, both in the Netherlands. Among the books Gielen has written are ‘Art in Networks’ (2003) and together with Rudi Laermans ‘An environment for contemporary art’ (2004) and ‘Cultural Good’ (2005). His last monographic works are ‘The unattainable inside of the past’ (2007) and ‘The Art Institution’ (2007). Gielen edited Open 16. Cahier on art and the public domain, ‘The Art Biennial as a Global Phenomenom. Strategies in Neo-Political Times’ (March, 2009) and together with Paul De Bruyne the book ‘Being an Artist in Post-Fordist Times’, to be published at the end of 2009 together with his new monographic work ‘The Murmuring of the Artistic Multitude: Global Art, Memory and Post-Fordism’. The murmuring of the Artistic Multitude: Global Art, Memory and Post Fordism is the 6th publication in the Arts in Society series published by the Arts in Society research group at the Fontys College of the Arts in Tilburg (Netherlands). 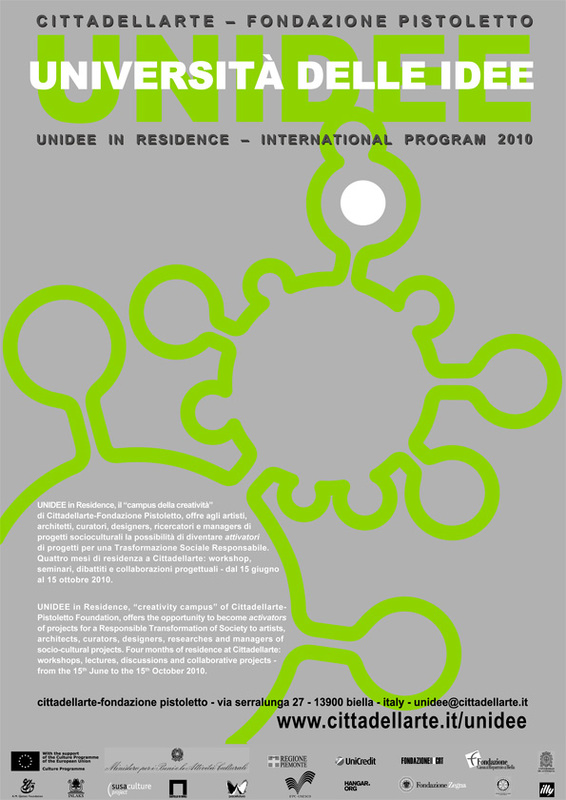 In keeping with the general research framework of the programme, the series of publications seeks to describe and explain the interaction between the social changes (technological, scientific, economic, cultural-political) and artistic practices. Partly inspired by insights from critical theory, the programme researches the possibilities of an ideological (re) positioning of the arts in society. The programme is open to potential publications in the forms of essays, theoretical texts, practical artistic research and research assignments. Iba, Carlo, Chicca and Micole came to Cittadellarte from the organisation LA PIGNA MON AMOUR, part of the Community of Sanremo. They came to initiate a discussion about a mini one week residency the UNIDEE residents will make in the community of Pigna, San Remo (Liguria) this August. They explained that the organisation is trying to give back new life to the abandoned old town and make San Remo inhabitants come back. They know it’s a difficult place to live, there are no cars, no large streets, no facilities, but in their spare time they invest many hours to create new forms of entertainment not just for tourists but also for locals. Germano Celant is credited with the invention of the term, “Arte Povera” in 1968, a new art movement of Italian artists who had great success internationally: Boetti, Merz, Zorio, Pistoletto, Penone, Fabro, Kounellis, Pascali. the movement was theorised by him in numerous exhibitions and publications like “Conceptual Art, Arte Povera, Land Art” (1970). After “Off media” (exhibition and book in Bari 1977) he was asked to collaborate with the Guggenheim Museum, New York, where he is now senior curator. He furthered the Italian cause internationally – such as the exhibition “Italian Metamorphosis 1943-1968”, in the Guggenheim (1994), and also with shows in the Pompidou Centre in Paris (1981), London (1989) and in Palazzo Grassi in Venice(1989). Also in the Palazzo Grassi he curated the retrospctive “Futurismo e Futurismi” (1986). 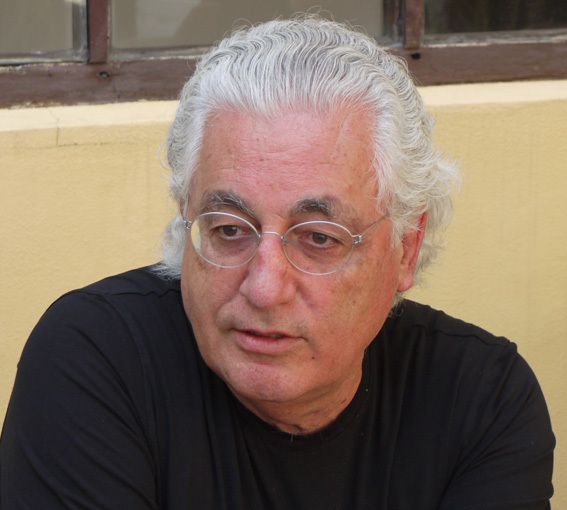 He became the director of the 47th Venice Biennale (1997). In 1996 he curated the first Biennale of Florence “Art and Fashion”. He has also written for many magazines and published theoretical texts and essays (“Inespressionismo” 1988), in 2004 he curated the exhibition “Arti&Architettura” in Genova. ﻿﻿Emiliano Gandolfi is an architect and independent curator with specific interest in the relations between architecture, art and urbanism. He is co-founder of Cohabitation Strategies, cooperative for socio-spatial development, and an advisor for the Curry Stone Design Prize. As a member of iStrike Foundation he is been working on urban development projects in Douala, Cameroon, involving artists and designers to work with local communities. Gandolfi was co-curator of the 11th International Architecture Exhibition – Biennale di Venezia, and before this role, he was curator at the Netherlands Architecture Institute (NAI) in Rotterdam, working on exhibitions such as Spectacular City and Newer Orleans. 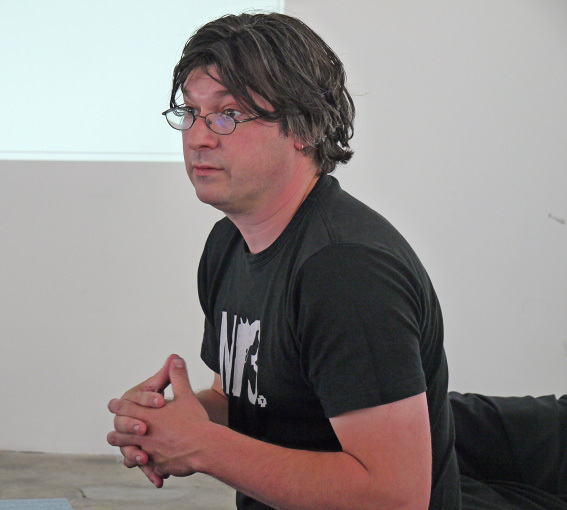 As part of the 2007 International Architecture Biennale Rotterdam he curated A Better World, an exhibition and series of public events on architecture and activism. Jointly to his contribution to Biennale in Venice, Gandolfi was the initiator of REbiennale, a project with the aim of recycling the leftover materials from the Biennale into public facilities, as community gardens, spaces for local aggregation and public events. Over the past years he has been involved in a wide range of projects, exhibitions and conferences that deal with methodologies and interventions for urban transformation, on both theoretical and practical level. He has lectured and organized conferences in many institutions worldwide; he is currently guest teacher at the National University of the Arts in Taiwan and course coordinator at TU Delft. 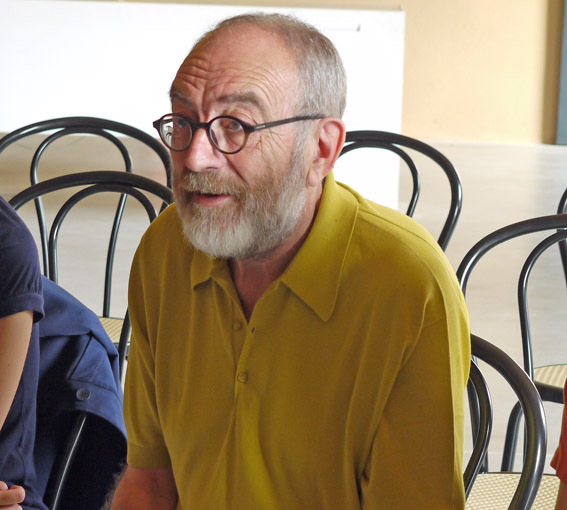 As a writer and critic he has contributed to several magazines, such as “Volume” (Amsterdam), “Artforum” (New York) and “L’espresso” (Rome). 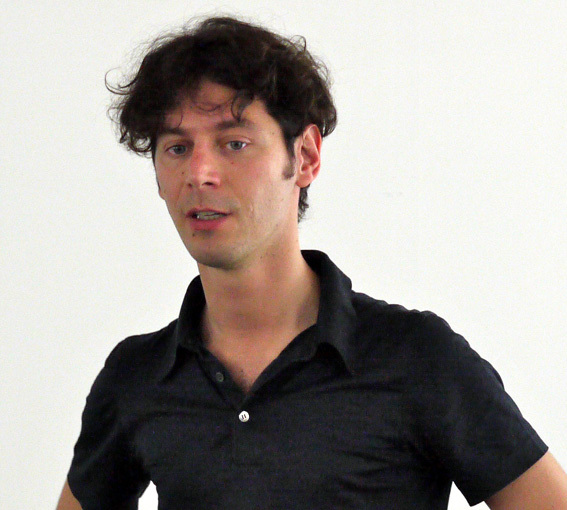 He was the editor of Spectacular City (NAi Publishers, Rotterdam 2006) and contributor to various other publications.